A state-of-the-art and efficient railway network is the backbone of any country's economy. At C&C, we are committed to pulling out the bottle necks along India's growth path by working on the world class railway Dedicated Freight Corridor of India. New lines. New bridges. Dedicated freight corridors. A record budgetary allocation of Rs 37, 000 cr. 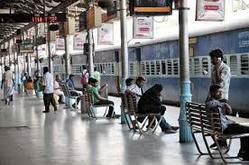 The investment in India’s railways is expected to be Rs. 1, 495 billion over 2008-12. Tantia enjoys a four-decade experience in the business. Providing end-to-end solutions. Across challenging terrains. The complement is likely to translate into bigger business. Since 1997, PCTS Infrastructure is engaged in the eld of Railway infrastructure development, involving design, drawing, supply, erection and commissioning of Overhead Equipment in PAN India and have successfully completed more than 500kms of work for Indian Railway. KEC is a complete turnkey solutions provider in the Railways Infrastructure EPC space. It is one of the early entrants in the Railway electrification space, having electrified more than 15, 000 kms of Indian Railways. The Company on its path of growth has further expanded its operations by foraying into railway EPC business 2010, with a vision to accelerate economic development through deep and broad EPC services. Simplex partners the Indian Railways building rail infrastructure – rail tracks, station buildings, bridges and culverts across the country. Among its several strengths, it is the pioneer in automatic track-laying for high speed tracks. Company has recently completed 200km Gooty-Pullampet section.